Lake Wister State Park is nestled along the shores of the lake and offers gorgeous views like this one as well as camping, cabins and plenty of outdoor activities. Lush, wooded mountains meet cool, shimmering waters at Lake Wister. 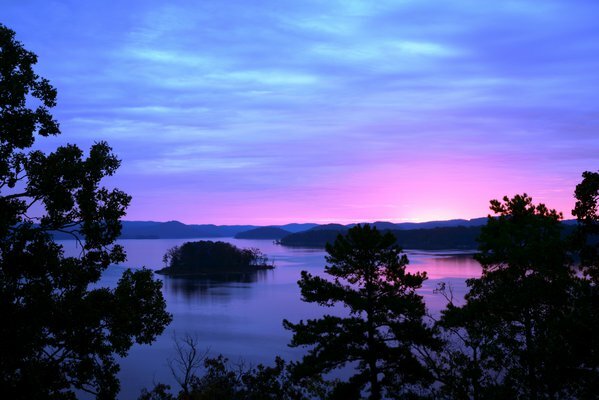 The Sans Bois, Jackfork, Kiamichi and Ouachita Mountains surround this truly idyllic lake in southeastern Oklahoma’s Choctaw Country, making for some spectacular scenery. Come take a dip, cast your line or simply take in the beauty of this gorgeous lake fed by two major rivers and trickling mountain streams. The lake is the star of the surrounding Lake Wister State Park, a haven for outdoor recreation that serves as a gateway to the awe-inspiring Ouachita National Forest. From there, it’s a short drive to Heavener Runestone Park, a day-use park featuring stunning landscape, a picturesque waterfall and a massive boulder with mysterious ancient carvings etched onto its side—possibly by Vikings! Satisfy your appetite after a day of exploring at Southern Belle Restaurant, a comfort food hotspot located inside a WWII-era railcar. These stops are perfect ways to round out your trip to Lake Wister, but the lake alone is worth the drive. Hugo Lake, the crown jewel of beautiful Hugo Lake State Park, is a can’t-miss destination for water lovers in southeastern Oklahoma. Located on the Kiamichi River, this lake offers fantastic fishing along with a swim beach where you can beat the heat in the summer months. Pitch your tent at one of the park’s several camping areas, or mount your horse at an equestrian site for overnight visits. This large, scenic park with miles of paved road also provides excellent hiking, jogging, cycling and horseback-riding opportunities. Venture into nearby Hugo after your trip to the lake and see what this charming, historic southern Oklahoma town has to offer. Check out Mount Olivet Cemetery, the final resting place of rodeo greats like Lane Frost, Freckles Brown and Todd Watley. You can also pay your respect at the Showmen’s Rest area, the final resting place of circus performers and owners who spent winters in the area during the early 20th century, for a unique slice of local history. Get up close and personal with the second-largest herd of Asian elephants in America at the Endangered Ark Foundation. Marked by rolling timber, wooded mountains and cypress-lined bayous, Choctaw Country in southeastern Oklahoma is the perfect backdrop for a day on the water. Located along the southwestern edge of the Ouachita Mountains, the 3,350-acre McGee Creek Reservoir is the place to go for amazing views and unbeatable outdoor fun. Anchoring the surrounding McGee Creek State Park, this gorgeous area boasts 25 miles of hiking trails as part of the McGree Creek Natural Scenic Recreation Area Trail System traversing gentle rolling timber and unusual rock formations that make for some truly spectacular scenery. You can camp in a tent or hook up your RV for the night, but McGee Creek State Park also offers eight rustic, air-conditioned lake huts each with bunk beds, a fireplace and a back porch overlooking the lake. No matter how you kick back after your day on the water, you’ll definitely want to check out this gorgeous lake and state park outside of Atoka. Feeling hungry after a day at the lake? You can’t go wrong with a trip to Cazadorez Mexican Restaurant. The folks at this family-owned Tex-Mex hotspot in Atoka serve up all the classics like chicken enchiladas and deep-fried chile rellenos in a casual, family-friendly atmosphere. If you find yourself craving more outdoor adventure, travel north to Cirlce P – Pogue Ranch in nearby Stringtown, where you can enjoy hunting, fishing and boating, or unwind at the property’s beautiful and spacious lodge. Whatever grabs your interest, you’ll definitely want to come see what makes this corner of Choctaw Country such an unforgettable retreat.